Thai fruit and vegetable carving is a timeless tradition filled with beauty, imagination and skill. Come and learn with the pros at Siam Carving Academy! 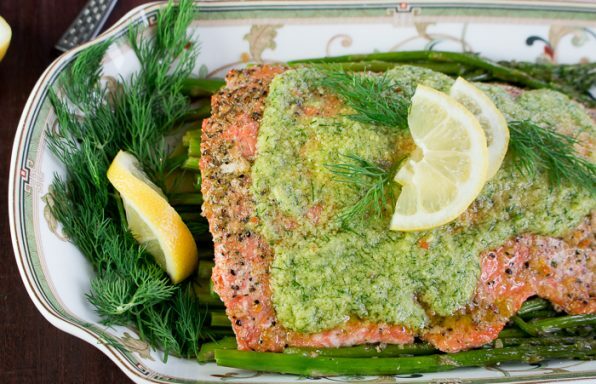 Have you ever dreamed of learning how to carve like the master chefs? Now this goal is well within your reach. 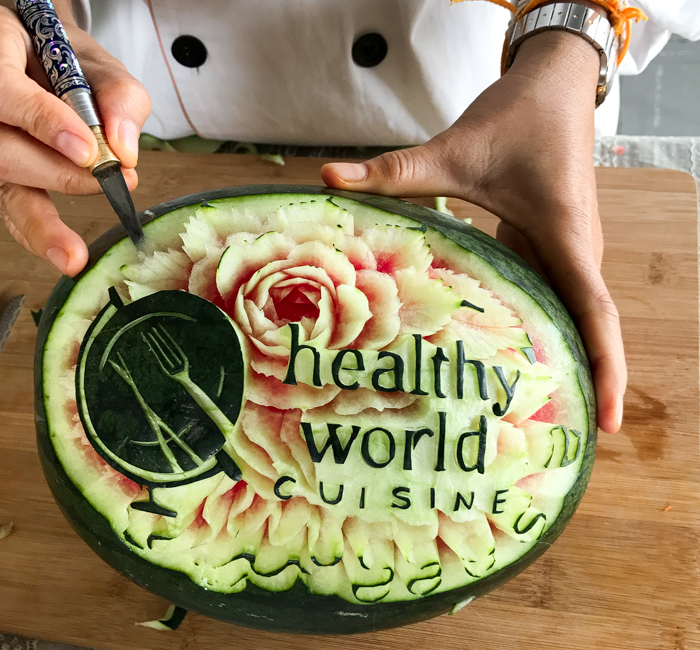 Learning the art of Thai Fruit and Vegetable Carving is every foodies dream come true. Enjoy a ½ day fun class up to full 10 day expert carver course with certification at Siam Carving Academy. There is a class made just for you! Khun Wan and the Siam Carving Academy Team are masters at their profession and most importantly can take your skills to the next level with structured guidance and diligent mentoring. Bangkok, Thailand is one delicious city filled with some of the best wet markets and street food to tantalize your taste buds. 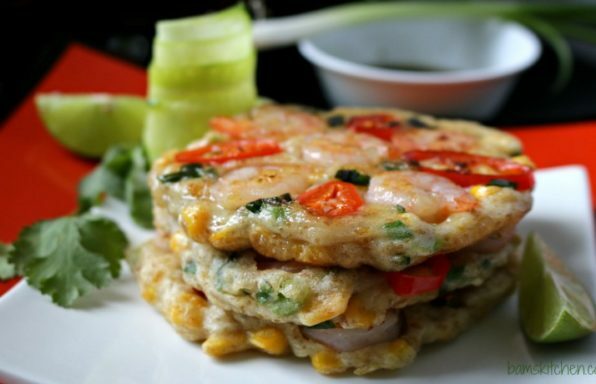 However, you will only be able to experience the deep roots and culture of Thailand by learning part of their culinary culture through carving. 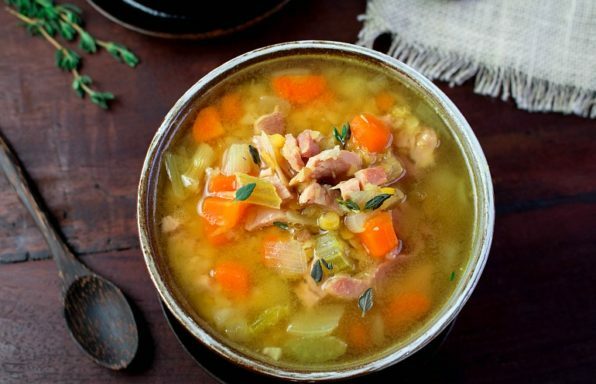 Hey there all the Healthy World Cuisine World Travelers! Get those flights booked to Bangkok, Thailand. There is so much to do once you arrive. The first agenda item is a Thai massage after that long flight and then time to start the foodie tour. 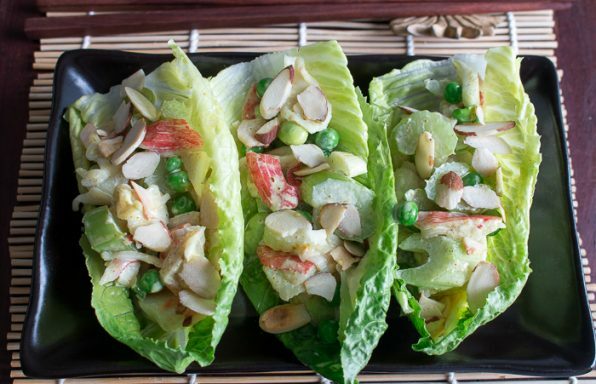 There are the floating markets, wet markets, night markets, temples, cooking classes and of course schedule your Thai Fruit and Vegetable classes with Siam Carving Academy. Siam Carving Academy is conveniently located just a few minutes walk from the train or you can take a taxi. tuk tuk or an uber. Thai Fruit and Vegetable Carving history goes back to the 13th century. Even now, many of the primary and secondary Thai schools offer this art as a part of their curriculum. Siam Carving Academy is a one of kind carving school. 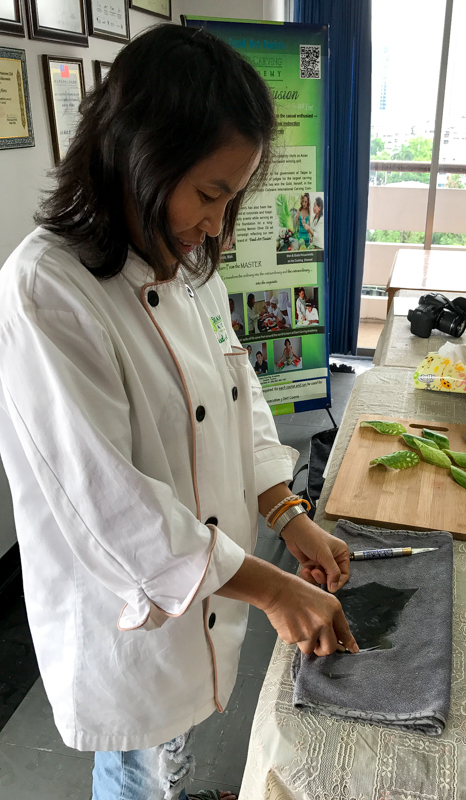 There are many cooking schools in Thailand where you go to the wet market, learn how to make a Thai dish or two and then maybe carve a veggie rose. 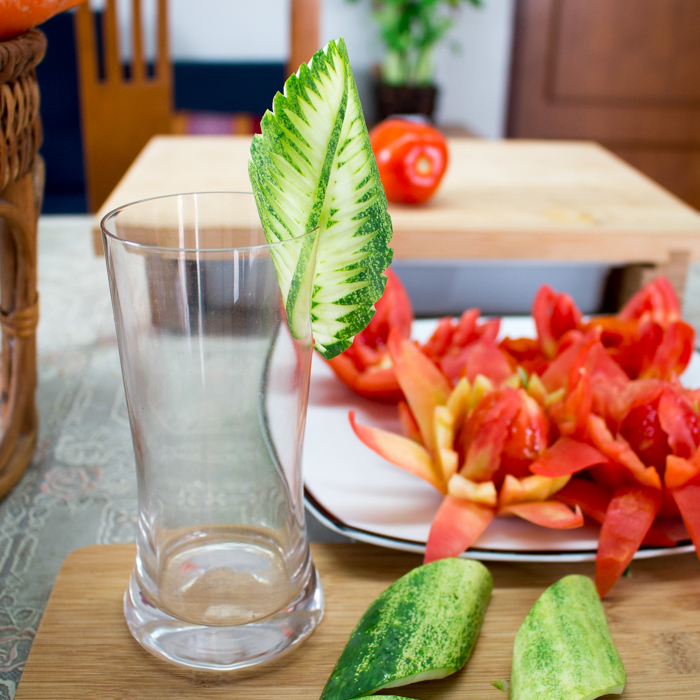 However, Siam Carving Academy is the only Thai fruit and vegetable carving school in Bangkok that can provide you with a certification in carving. When you watch the skilled hands of Khun Wan, it is like watching a ballet. Every step perfectly guided, every movement of the knife level and exact. It is like watching a picture unfold as you watch her carve. It is magical! 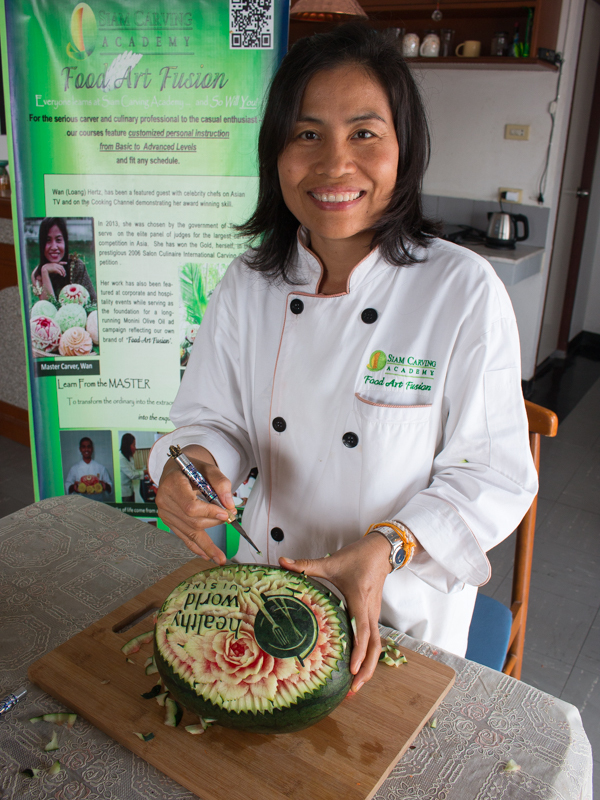 Thai fruit and vegetable carving is purely magical and one of the most enriching experiences in Bangkok, Thailand. So what are you waiting for? Sign up HERE for one of Siam Carving Academy courses and find out for yourself. There are fun ½ day and whole day courses for the beginner. 3 day course for intermediate training. If you are a chef, you will just love Siam Carving Academy's 10 day Complete Thai Master-Carver Series. Upon completion of the 10 day course, students receive 3 special certificates each one being eligible for 20 Continuing Education Credits from the American Culinary Federation (ACF). Siam Carving Academy will make you feel welcome from the moment you arrive in the city. Khun Wan greets you with a smile and Khun Larry is super organized. 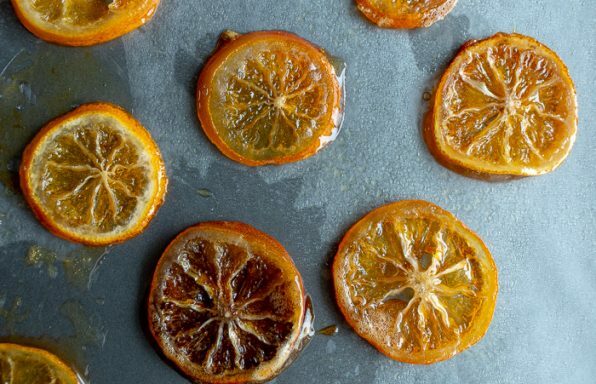 Together, this husband and wife team will make you a carving super star. There are no prerequisites for joining their carving courses other than a desire to learn. They have had students as young as 11 years old and up. 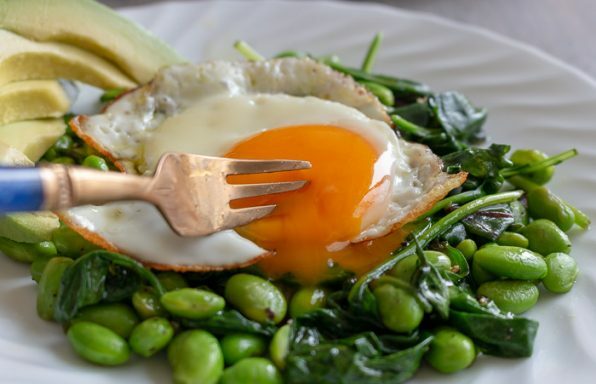 General knife skills are helpful and bring along your reader glasses if you have trouble seeing up close. 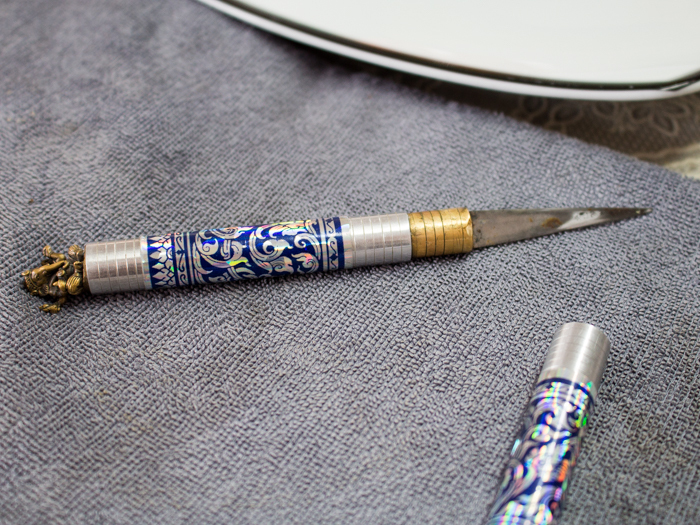 Other than that, Siam Carving Academy will provide everything else you will need. The carving knife is easily sharpened with damp fine grit sandpaper. 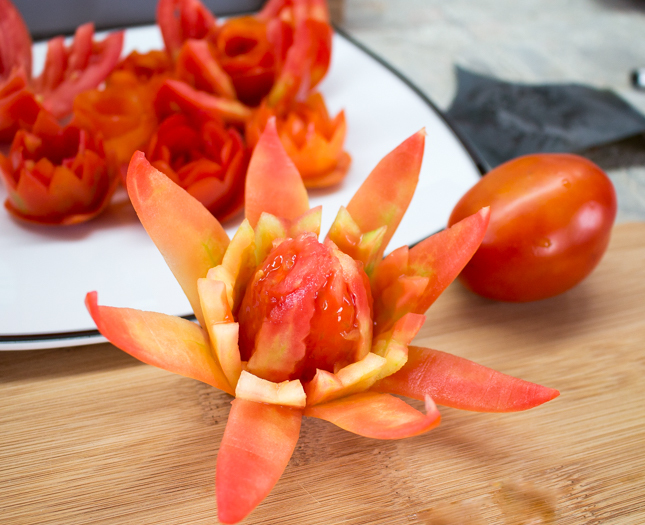 You will start out carving small roses with tomatoes, intricate cucumber leaf garnishes for cocktails and beautiful carrot flowers and other designs. These teach you the basic foundational carving techniques. For some of the intermediate courses you are doing more intricate designs and by the end of the master carver course, you will be carving dragons into fruit and making stunning masterpieces. 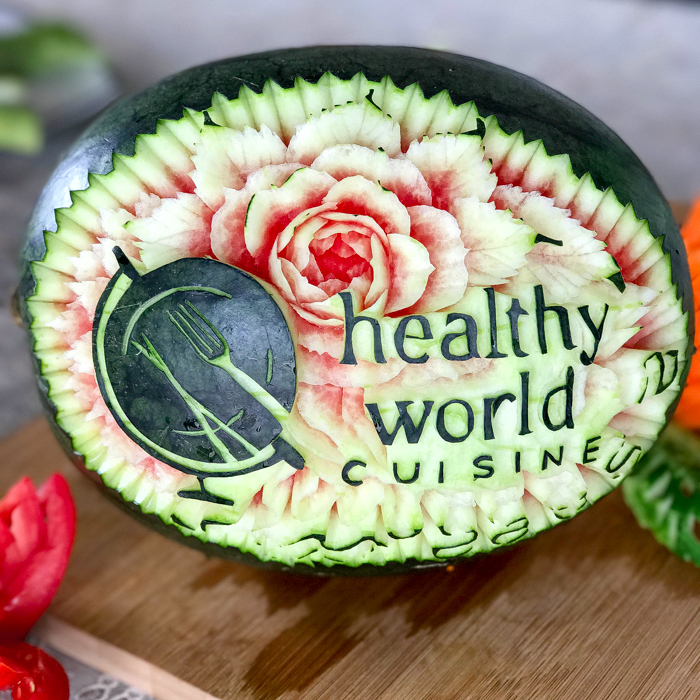 Khun Wan made this beautiful watermelon logo for Healthy World Cuisine. Isn’t it just gorgeous?! (It is so pretty and so detailed. We love it! We wish it could last forever.) The watermelon has so many layers of detail. There is the color from the dark green skin to the pale light green rind and bright pink flesh that makes the flowers and design beautiful. 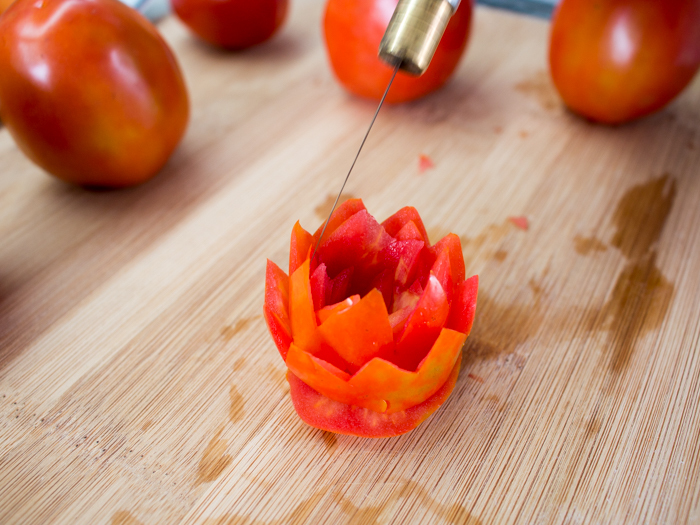 Practice, practice, practice is what is needed to keep these intricate fruit and vegetable carving skills. 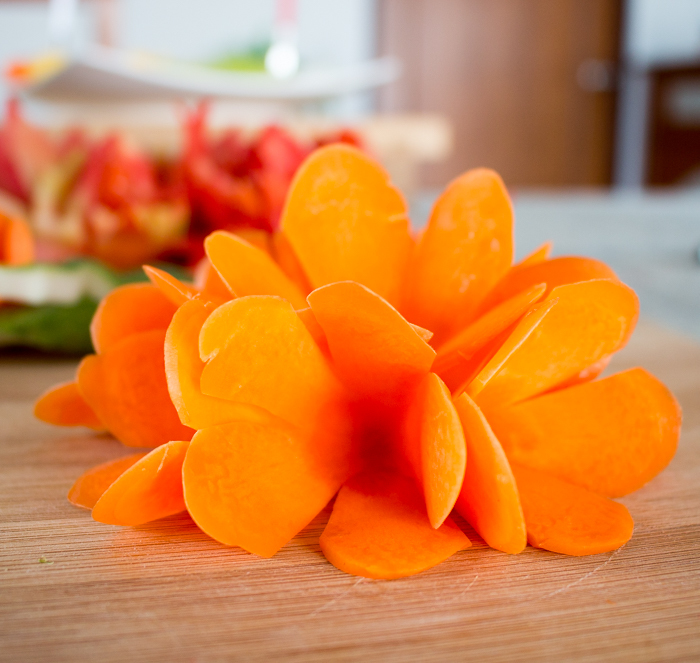 Every day, we practice with one carrot making flowers. We cannot wait to come back for the next lesson. 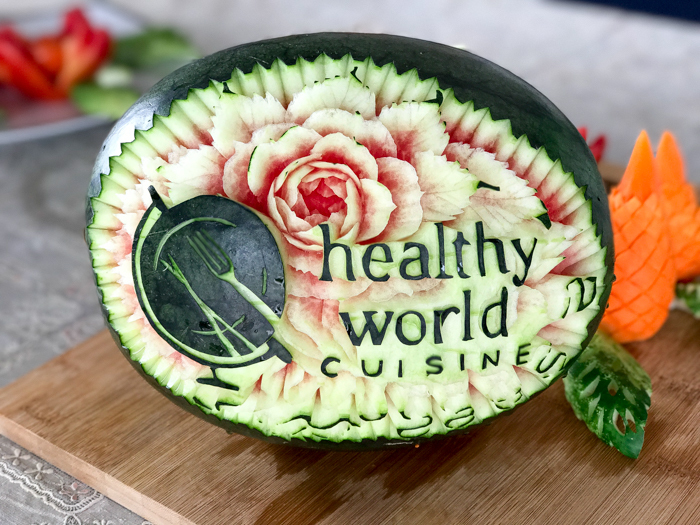 Whether you just want to learn how to make pretty accent fruit and vegetable carvings for your appetizers and cocktails or are the lead chef at a restaurant and catering a huge crowd, your fruit and vegetable carving skills will be the center of attention.